The Goonies II (グーニーズ2 フラッテリー最後の挑戦, The Goonies II: Fratelli Saigo no Chousen?, The Goonies II: The Fratelli's Last Stand) is an adventure game developed and published by Konami for the NES. It was released on March 18, 1987 in Japan, November 1987 in North America, and on December 19, 1988 in Europe. 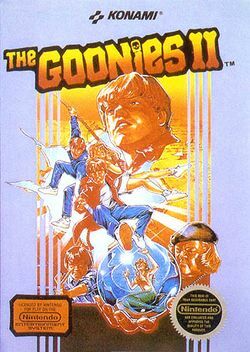 It is a sequel to the first Famicom Goonies game, which was only officially published in Japan, although it was available in the United States on PlayChoice-10 arcade units. This led some people to believe that it was supposed to be a sequel to the movie The Goonies which was never produced. The game's story centers on Mikey. His friends, the Goonies, have been kidnapped by the Fratellis—an Italian family of small-time crooks and counterfeiters. Mikey must rescue all six of his friends and, inexplicably, free a captured mermaid named Annie who didn't appear in the film. Unlike the first Goonies game, The Goonies II is not a linear game. The player is free to explore any region of the Fratelli's labyrinthine home that he or she is able to reach, although certain Goonies cannot be rescued without the aid of particular items. The game also features a password system that the player can write down, and input at a later time to resume playing with all of the items collected and Goonies rescued when the game was last played, although the player will always start the game in the same initial location of the house. This page was last edited on 9 June 2013, at 17:58.